Quick Celebrity Sightings on a Game Show! 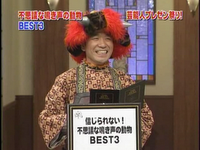 Shoko Nakagawa and Neko Hiroshi Appear on The Best House 123! Last week we were able to find more Japanese programming and thought we’d watch a few game shows. One of the ones we watched was a TV show called The Best House 123! and this particular episode was a two hour special that featured celebrities playing. The premise of this game show is a little bit different. The players each pick their top 3 of anything they want , and prepare a short video presentation on their picks. Then on the show, the hosts at random using a buzzer choose a few of these presentations to be shown on the show. Viewers at home then vote on which player’s presentations they liked best, and the best ones are included in a book called “The Best Encyclopedia”. It’s kind of a neat show and definitely a change from the image of most Japanese game shows that we have seen where players are subjected to strange obstacle courses or get an electric shock when they do something wrong. As we mentioned above, last week was a two hour celebrity special, and two celebrities that we have reported on in the past were players and also had their presentations chosen. Now we would have loved to upload some clips of the show, however after heeding the warnings on Fuji’s site, we elected to post some screencaps and a summary instead. Shoko Nakagawa appeared on the show and cosplayed as Haruhi Suzumiya from “The Melancholy of Haruhi Suzumiya” – a popular anime which we are sure most of you have heard of by now! Shoko was the third to be chosen to present second, and for her topic she picked the Best 3 Dismantling Operations. We were surprised, we totally expected her to do the top 3 best cosplays in the world or something to that effect :p. In third place was a case in China where 16 apartment buildings were demolished simultaneously. This took place in 2005 in Yunong Village, and the engineers had made a computer simulation to map out how best to make the buildings fall as not to destroy other buildings that were nearby. They showed a shot of one building which survived the blast (but all the others around it were destroyed). Her second place pick was the dismantling of a gas tank in Japan that was inspired by a housewife’s apple peeling – spiraling around only once and getting the peel out in one shot. So they cut off the bottom of the tank and worked slowly spiraling around the top of the tank. This method takes about a week compared to an older method that took a month to dismantle the whole tank, and earned the engineers at Bestera a patent. Shoko’s top pick for her topic was the destruction of a B-52 Stratofortress. Here’s some history for you all. In 1991, the US and Russia signed the Strategic Arms Reduction Treaty. 365 of these aircraft were flown to Arizona, all the useable parts were salvaged, and then a 13,000 lb blade was dropped from a crane and chopped the planes into several pieces. Shoko seemed really fascinated with this one! Neko Hiroshi (Real Name: Takizaki Kuniaki) is a popular comedian in Japan who is very short and incorporates his infamous cat motions (a cat paw gesture followed by “nya!”) in his routines. Neko played Kami-Sama in Bishoujo Celeb Panchanne – a series which we have been following very closely on Moon Chase because of it’s similarities to Sailor Moon! Neko chose to talk about the top 3 animals that sound like other animals. In #3 was a species of frog in Japan that sounds like a dog when it croaks/barks. It was discovered in Neba Village in Nagano in 2005. There is a mansion that people can visit just to hear this new species of frog bark! #2 is the cheetah, which has the ability to sound like a chirping bird along with the scary growls that we are all familiar with. #1 went to the giraffe, which can grunt and bleat like a cow. At the end of the show , all the contestants laughed at his entry. Neko Hiroshi can currently be seen in the Live-Action Saiyuki (unrelated to the anime of the same name) movie that was just released in Japanese theaters. He is playing the false Cho Hakkai. There were other presentations that were made , such as the best glassware, aquariums, haunted houses, cutting devices, poisonous sea animals, and the kicker: the best women who turned into men. As of this writing we are unsure which ones have made it into The Best Book. It seems Toku-Comedy hit Panchanne was only destined to last for no more than 13 episodes – and we are sad to see Masataka Takamaru’s show go! The very last episode, Calm Last Time aired Tuesday evening in Japan. Albeit it was very cheezy , but it was a good parody of Toku elements from the 60’s until today! Fans though can enjoy the series over and over again as the DVDs will be released in August. Volumes 1 & 2 will be released on August 27th in Japan and each will contain bromide cards and postcards. Volume 1 will contain the first two episodes, a creditless opening and ending, and a special interview with the production staff about the creation of this series. Volume 2 will only contain the photos and episodes 3 and 4. The singles of the opening and the ending have also been released. And for those of our readers who love to cosplay, Cospatio (A Cosplay Tailor in Japan) has put up the Panchanne costume for sale! Cospatio was featured in the series for creating the costumes that Haruna Yabuki and Himawari Kitayama wore, and the series was so popular that they will tailor this costume to suit you! We will keep readers posted when we know the release dates of the other volumes! Both stores ship around the world – however we’ve only had experience with yesasia.com. We really like their online store (even during Christmas their packages have arrived within 2 weeks from Hong Kong!) and if you order two qualifying items you can get a free gashapon/capsule figure! And for all you Sailor Moon Collectors, we totally recommend this Special Edition Sailor Moon Figure. It comes with a magazine that shows every Sailor Moon Gashapon ever created and the detail on the special edition figure is astounding! It’s worth the ridiculous price, trust us :). In the meantime, we invite fans to be the judge again as we show you the major highlight of this episode! Two episodes ago, Panchanne and Panchanne Mini encountered the Super Evil Devil – who bore an eerie resemblance to Tuxedo Kamen! Panchanne was swept away romantically by the Super Evil Devil, but Panchanne Mini began to cry because she didn’t want her family to break apart. Panchanne Mini ran away , and was later found by her mother and the two fought for Panchanne Mini to come home. And then they were approached by the Devil, making Panchanne Mini angry and sad. 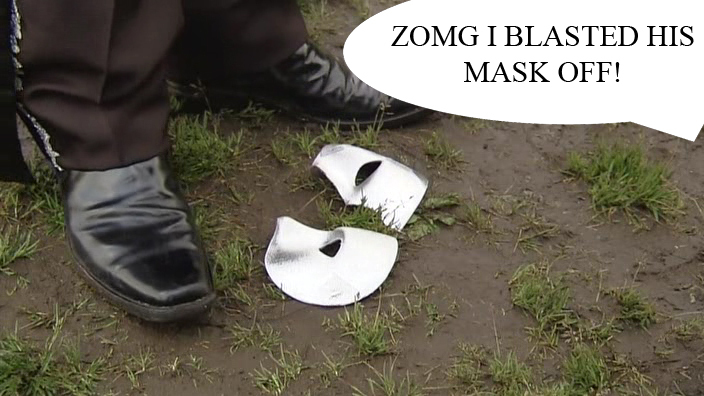 Lo and behold , this very last episode (spoilers ahead!) revealed the identity of the Devil. We will now show you some images along with a few captions. 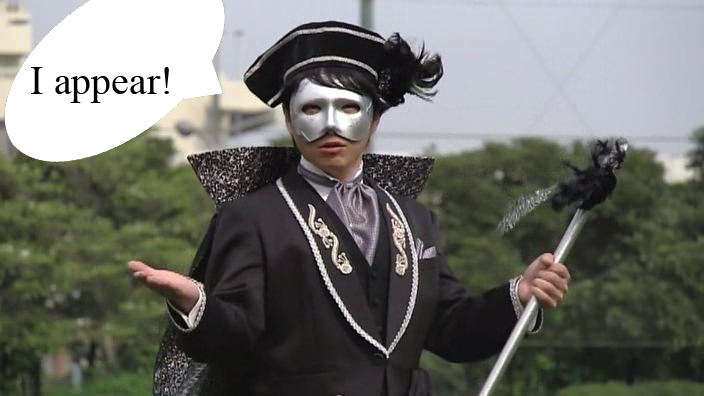 Again, you be the judge – we think Super Evil Devil is very reminiscent of Tuxedo Mask! News From the Other Side of the Pond #3! Hey Moonies! Before we begin we’d like to extend a huge thanks to TV in Japan for linking us yesterday and helping to increase awareness of our corner of the internets! We really appreciate it and we have linked the site on our links sidebar! There hasn’t been much news on what the stars are up to lately; though if you are interested in seeing Paprika (which stars two former Sailor Moon Seiyuu) we suggest you click here to see where the premieres are. Indie cinemagoers, now is a great time to start begging the management with this article in hand (for the distributors are listed!) to bring this movie to your own hometown! Panchanne Destined to Have a Connection to Sailor Moon? We were lurking around several Japanese pages when we learned of something very interesting! 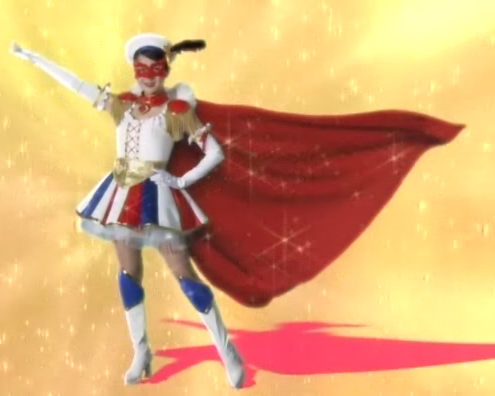 As we all know already, current Tokusatsu Comedy hit Bishoujo Celeb Panchanne is based on an earlier Toku series from the 90’s called Bishoujo Kamen Poitrine. Poitrine was a superhero much like Panchanne except that she had a flying car, as well as a much older and scarier Kami-Sama who would turn her into a frog. The creator of Sailor Moon, “Princess” Naoko Takeuchi has stated a few times that Potrine served as her inspiration for Sailor Moon. And oh, the irony! The director of PGSM, Masataka Takamaru, is directing Panchanne! Yuuko Hanashima, who played Poitrine, starred in this week’s Panchanne! She played a woman who has the hots for Kensuke Shinjo, aka Panchanne’s alter ego’s husband. What a circle we have here! We have to wonder if Naoko will pen an episode or perhaps appear on the show considering all these connections to Sailor Moon! EDIT: We also just learned of a news story where Haruna Yabuki admits that playing Panchanne is like a dream come true for her, because little girls look up to her! 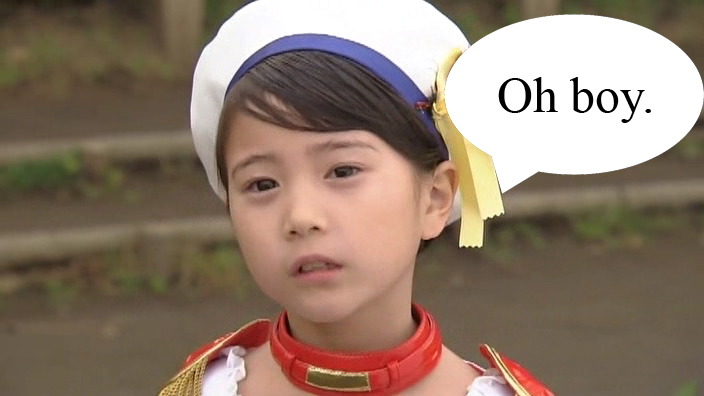 Much in the same way she looked up to none other than Sailor Moon when she was growing up! Maybe This is the Reason for that Sailor Sighting in War of the Worlds? The summer 2005 hit War of the Worlds to some Otaku is more than seeing Steven Spielberg direct megastars like Tom Cruise and Dakota Fanning. This movie features a small Sailor Sighting. Dakota Fanning’s character watches our favorite superhero trash a youma using Moon Gorgeous Meditation. What was even more surprising was the credit that appeared at the end of the film which left everyone guessing why the sighting was there and how they were able to get permission from TOEI. Steven was recently interviewed about the Transformers Movie in Japan, and confessed the missing piece of the puzzle! Turns out his 11 year old daughter loves Sailor Moon, though we are unsure whether he is speaking of Mikaela or Destry (the article makes no mention). Later he also mentions that his daughters wishes sometimes have priority over his own. We wonder if this is the reason for that Sailor Sighting in War of the Worlds? He also talks about his admiration for Japanese animation, having taken his first plunge with Spirited Away. Japan’s MTV held their Video Music Awards this past May 25th. Popular idol and Sailor Moon fan Shoko Nakagawa appeared on the red carpet, striking this very familiar pose! Many asked her about her obsession with Sailor Moon and she said it was just a hobby- while they remarked it was something much deeper. And it probably is considering that Sailor Moon characters are among her favourites to cosplay and model, as well as naming her cat after Luna. 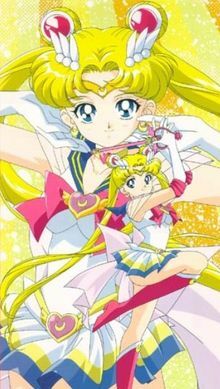 NEC to Offer Sailor Moon Episodes For Free! Those of our Japanese readers who have access to NEC’s BIGLOBE service are in for a bit of a surprise! From June 7th – July 5th, the service will be offering streaming anime for free! Sailor Moon is part of this promotion, as are other TOEI titles such as Galaxy Express 999 , Gun Frontier, and Fist of the North Star. We would love to hear from fans who try out this service! Survey Shows Sailor Moon Initiated Many Otaku! We also learned of a very interesting study which was conducted recently in Japan to learn more about Otaku – we’re going to summarize the results as best we can. This was a questionnaire to determine the basis of the interests of Otaku – were they video games? Comics? Anime? Of 601 people surveyed, 68% were male and 32% were female. 10.1% were teenagers, 30% were between the ages of 20-25, 22.8% were between the ages of 26-29, 21.1 % were between the ages of 30-35, 12.3% were between the ages of 36-40 and 3% were over 40. They were later asked at what age they started their fandom, and 1/3 people got interested in it during junior high. Then these were asked what anime sparked their interest, and 3.7% attributed to Gundam, 2.7% said Neon Genesis Evangelion, 1.0% said Final Fantasy, 0.9% said Sailor Moon, 0.9% said Tokimeki Memorial, 0.9% said Space Battleship Yamato, and 0.9% said Yu Yu Hakusho. While we always knew in North America, for some people Sailor Moon was the start, we didn’t think it would be one of the top answers in a survey in Japan! If we get a copy of the full report, we will definitely post more of it here! 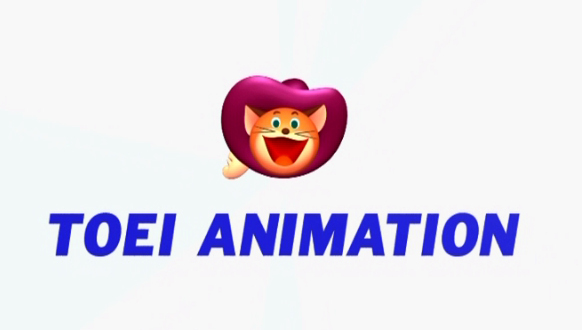 An Addenda to TOEI Creates In-house Licencing Division! We also managed to find this very interesting analysts’s perspective on the recent announcement from TOEI. This article discusses how TOEI is in a bit of a pinch considering that one of their three largest properties in North America , DragonBall Z, is lying mostly in the hands of Funimation. The article goes on to suggest that they should make use of their bigger properties aside from Digimon, such as One Piece… and Sailor Moon! We agree with their perspective that if TOEI really wants to make it big, they should also work with their other properties. Digimon isn’t as big as Pokemon in North America and while the dub of One Piece may not be very popular, the original Japanese version is very popular with North American Otaku. And more importantly, there is a huge amount of demand for Sailor Moon in North America. Fans want good quality DVDs with decent video transfers (if not like the remastered ones in Japan) and clear audio – things that currently only exist in a fan’s dream. Fans want more merchandise from translated versions of the manga re-release to goodies only found in Japanese stores. And of course, everyone wants Stars! And with that, we bring this News from Across the Pond update to a close. When we watched last week’s episode of Bishoujo Celeb Panchanne, we were reminded of a certain Sailor Senshi! Yumiko Shinjo’s alter ego is Panchanne, however Panchanne always seems to be around whenever her daughter Risa is in trouble! Well, the six year old finally put two and two together and revealed to her mother that she knew of her secret identity! So, Kami-sama made her a superhero too, and henceforth, let it be known to man that Japan’s newest superhero now has a sidekick: Panchanne Mini! But does Panchanne Mini’s Shiroganeze Attack Mini remind you of Pink Sugar Heart Attack? You be the judge! We have also learned that Bishoujo Kamen Poitrine’s younger sister also gained powers from their Kami-Sama and became her sidekick named Poitrine-Petit! Since our last update on this series, it seems the episodes have been pulled from Ameba Vision – however we will update everyone with links on YouTube so they can watch this show! EDIT: Sadly YouTube has taken down all of the episodes. Last Month, we reported on a new Tokusatsu being directed by Masataka Takamaru, better known as the director of PGSM . We have gotten ahold of the raws of the show and we are impressed with what we have seen so far! 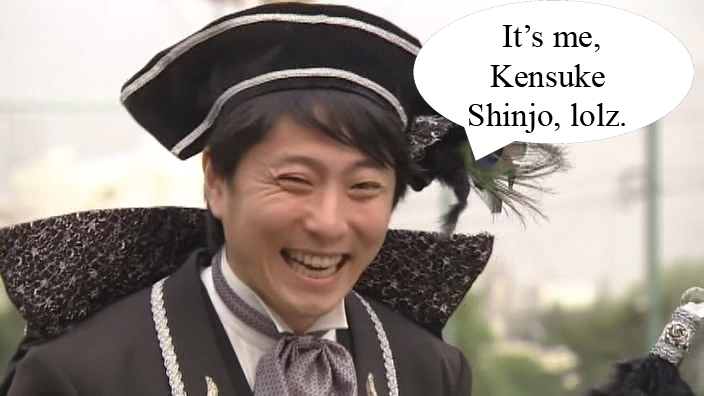 The show doesn’t take itself seriously at all, and pokes fun at a lot of elements of Tokusatsu! For example in the first episode when she receives her powers, she has no costume. She is then taken to Cospatio (a real cosplay tailoring service) to have her costume made. In episode 2, her wand doesn’t work and she’s told by her guardian (the God Kami-Sama) that she isn’t strong enough to attack, but near the end she finds out that it was just switched off! It’s also fun to see how she balances motherhood with her superhero duties as well! So for any fans who want to watch this show, we have found a streaming video service that allows users to upload videos longer than 10 minutes (Youtube has limits on time, and the episodes are there but in pieces). And here they are for your enjoyment! Edit: These have been removed!